Good morning from EPHQ everyone! Before I head out in a little while for a meeting in Belmont Shore, Long Beach – I’m totally excited to share an awesome Wedding Tip with you from my good friend and Partner of Esquire Photography; Shelly at Simply Bridal. 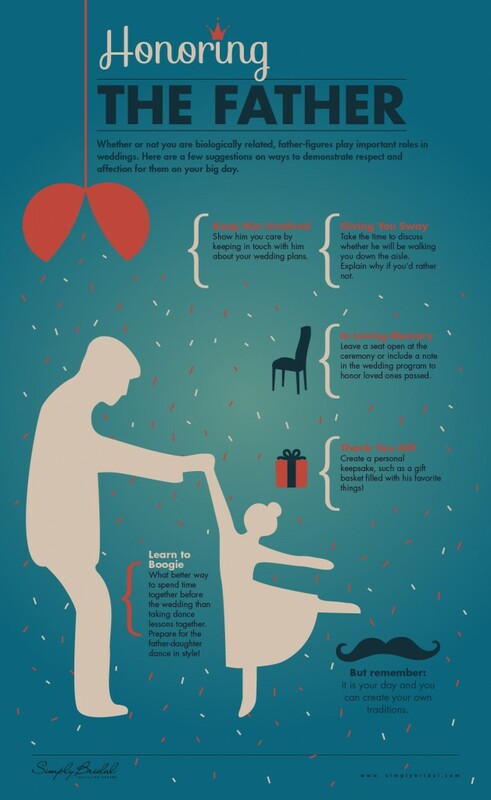 This week Simply Bridal has put together a great graphic showing ways on how you can honour your father on your wedding day. Check out what Shelly shared for you! To appreciate all the men in this universe Simply Bridal has put together a special infographic to remind you how you can keep your father-figure involved in your wedding. Having him walk you down the isle is the most rewarding role a father could ever have. Give your father an important role at your wedding to show that your affection and respect for him.